Looking for somewhere to get something sweet with your sweetheart this Valentine’s Day? 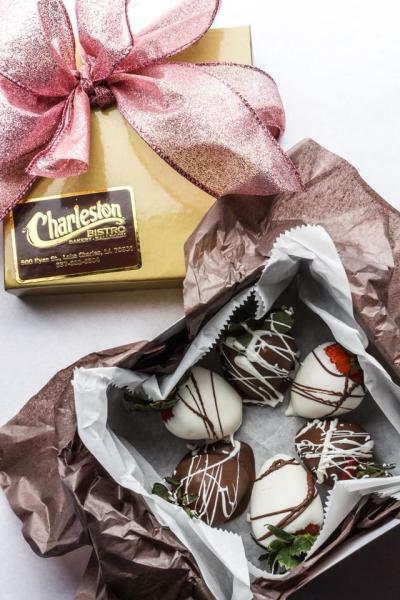 The new Charleston Bistro in beautiful Downtown Lake Charles has you covered (in chocolate!). Located in the lobby of the historic Charleston Hotel on Pujo and Ryan Streets, this quaint eatery is dripping with historic charm. Legend tells of a network of tunnels that ran beneath streets that connected the Charleston to the Calcasieu Marine Bank and the adjoining Majestic Hotel. This secret tunnel allowed well-to-do hotel guests, and visiting celebrities, to travel between the buildings and around downtown undisturbed. It’s also said that the first party in Lake Charles celebrating the repeal of prohibition was held in the ballroom at the Charleston. I’ll raise a glass to that! The new Charleston Bistro not only has a delicious full-service menu for lunch and dinner and an extensive wine list, but they also house a bakery, sweet shop, and bar with a whole menu dedicated solely to dessert cocktails. If you’re feeling thirsty and festive you can try the Caramel Pecan Chocolate Martini, the Tiramisu Martini or the White Chocolate Raspberry Martini. Most of the dessert cocktails are made with Godiva liquor – so you know it’s good. 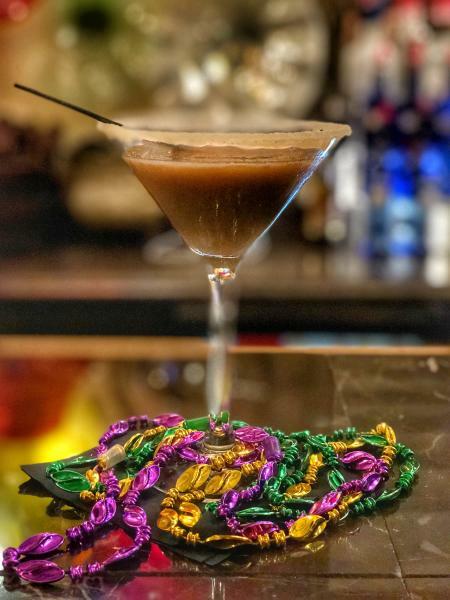 The bar also offers seasonal dessert drinks like the King Cake Martini, or Mardi Margarita. They are delicious sweet but pack a punch! Wine lovers – there is plenty for you to sample. More than 40 wines – whites, reds, sparkling – and you can buy it by the glass or bottle. Not thirsty? The Charleston Bistro also houses a full-service bakery. They do it all from macaroons to bonbons, and even cakes and cookies. If it all looks good and you’re having trouble deciding what to order, they also offer various sizes of gift boxes that include a sampling of everything. 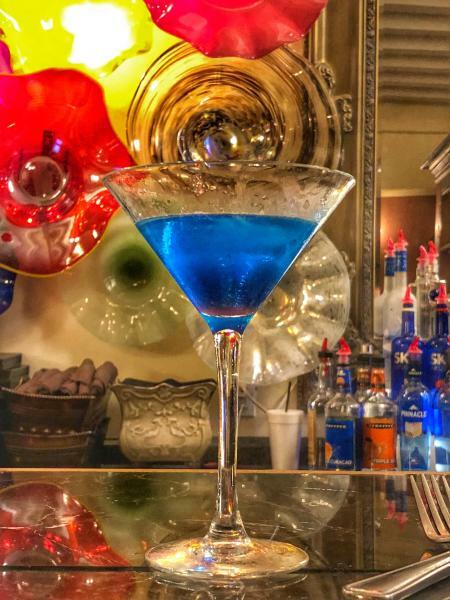 If your significant other has a significant sweet tooth, then the Charleston Bistro is the perfect place to visit for Valentine’s Day or just a special evening out on the town. John O'Donnell defies convention and lives life on his own terms. After years of traveling, primarily in Central and South America, doing mission work and studying leadership and expedition logistics John returned home to Lake Charles to study history at McNeese. He participated in Student Government and founded several organizations including environmental group called Blue and Gold Goes Green, who recycled more waste than any other college in the country, winning the coveted Recyclemania Competition in 2009. Since then, he's been a businessman, political consultant, and a community activist, volunteering his time for numerous non-profits. He now leads Healthier SWLA as their coalition coordinator, coordinating the efforts of over 170 organizations, businesses and governments whose mission is to get people to move more, eat better and stop using tobacco from a systematic and environmental perspective. He spends his free time traveling, cooking, writing about traveling and cooking, and competing in endurance events like ultra marathons and Ironman distance triathlons.